It’s that time of year when the basil is abundant. I always grow basil as it’s pretty easy to grow and I just love it. 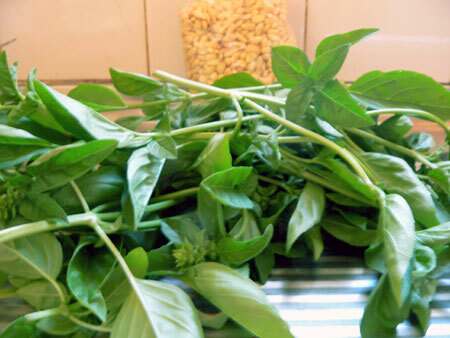 Basil can be used in salads – raw, and in cooking. I also love it as a base ingredient for pesto. As my basil was starting to flower I had to pick a lot of it to make into pesto. Because I’ve now trimmed my basil I’ll get more life out of the plants instead of going all woody. The first time I made this pesto I followed some recipe or other but now I know the base ingredients I just put them all into the ancient food processor I have to blend. I don’t use set amounts but just keep blending and adding ingredients till it looks just about like pesto should. So that’s my really basic and bare-bones recipe. If you’re after something a bit more precise and variations to the theme try this. After I made my pesto I cooked up some pasta, put some leftover roast chicken and some of my fresh pesto and had a delicious meal. Mmmm, mmmm. Ah – we get an really good basil crop here also, and pesto is a mainstay!!! I’m not sure about the taste of basil… I do like pesto sometimes. It sounds nice, your pasta dish. sounds great – how long does it last – my – ‘potluck recipe ‘pesto went mouldy – grew some penicillin . I want a herb and little vegie garden to I am looking for tips. Mine lasts a week or two, but when you make it, put it in little containers that can go in the freezer. That way you have pesto when you want. My mom has a huge herb garden and I love her pesto…basil is such a rich herb…looks like you and JJ are having a great summer…that tent looks great, and I would be so proud of him too for staying in it all night!!! Tried it on tuna steaks last night -fabulous!